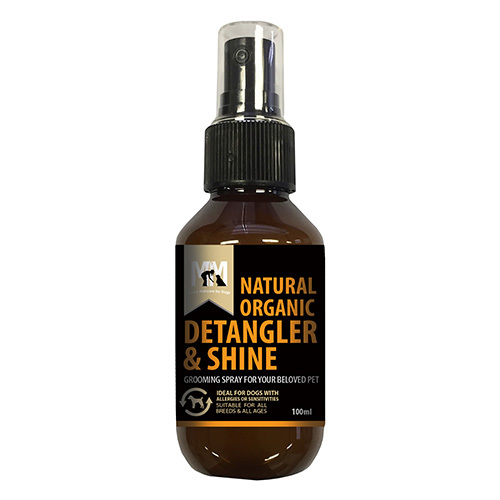 MFM Natural Organic Detangler & Shine Spray is a unique formulation for detangling and nourishing dog’s coat and skin. It is therapeutic grade oil that essentially supplies major oils required for shiny hair and coat. Enriched with vitamin B12, vitamin E and other 9 certified organic extracts; this detangler easily removes knots and smoothes hair without dehydrating the skin. It helps in enriching skin and coat of your dog. MFM Natural Organic Detangler comes in easy to spray bottle with no side effects in your dog. This exclusive natural formula contains essential juices and oils including organic aloe Vera juice, organic ethanol, purified water, coco glucoside, glyceryl oleate, coconut absolute oil, vanilla Oleosresin, organic macadamia oil, jojoba oil, organic lemon scented tea tree oil, citric acid, burdock extract, organic chamomile extract, organic lemonbalm extract organic rosemary extract, organic sage extract and organic chamomile essential oil. The soothing blend of oils hydrates the coat and skin while conditioning and detangling fur. It moisturizes the skin instead of drying without leaving an oily feeling. And the aromatic scents leave your dog refreshing. Shake the spray bottle well before use. Spray directly onto your dog’s wet or dry fur holding the bottle about 5-10 cm from him/her. Simple spray and a loving massage into the skin and coat. Leave the mixture on without rinsing. Brush to provide softness and shine to dog’s coat, lightly pull apart and separate the hair and then use a brush to patiently work the knot loose. Avoid spraying on the head and contact with eyes. Do not induce in dogs. Store it away from direct sunlight, in a dark, cool place. Keep out of reach of children and dogs. If in eye, flush with water. If irritation persists contact a veterinarian. Ensure proper closure after use. Really good product I am just surprised with the quality of the product and the results it has delivered. easy to use and quickly detangles hair. I like this product as it leaves my dog shiny and fresh. It removes all tangles easily.